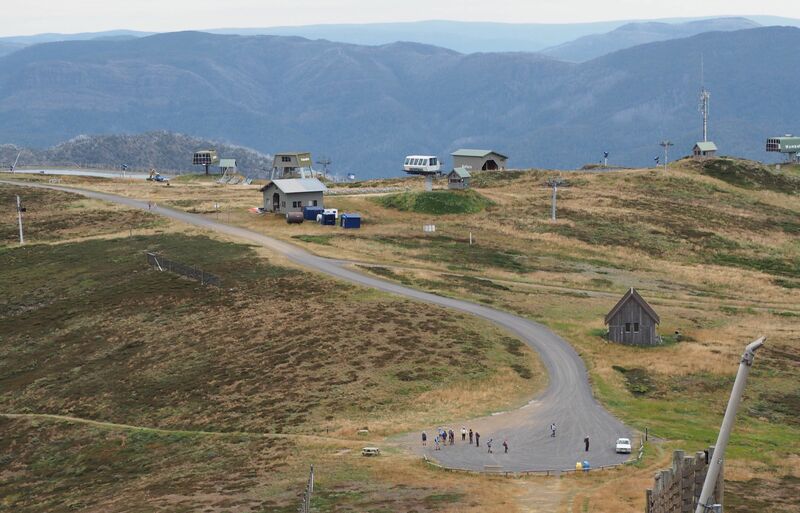 January once again saw two weeks of the popular summer mountain camps, this year at Mt Buller. This is a report for the second week. The trip across from Adelaide was uneventful with an overnight stop in Bendigo. Excitement began to build as we drove up the winding road from Mirimbah to the summit of Mt Buller. Locating our ski lodge proved to be easy and we were greeted by Chris who informed us that we were lucky last to arrive. The weather forecast for the first day was not encouraging with rain predicted by lunchtime. 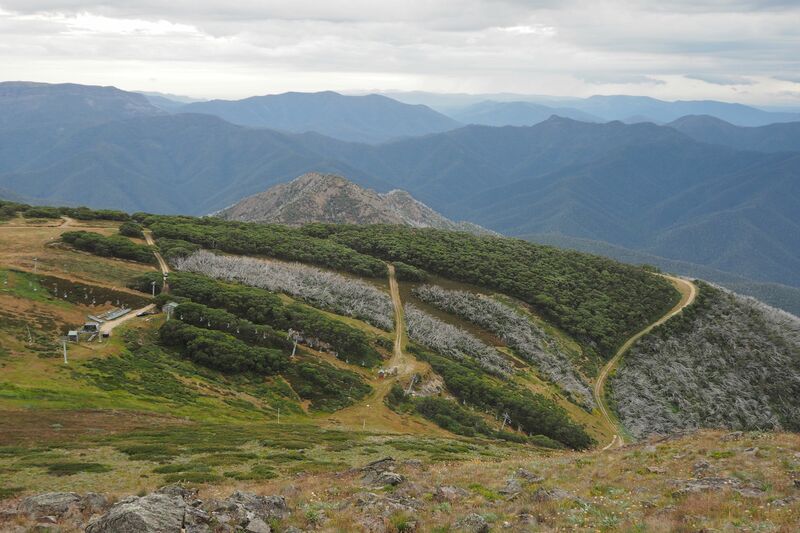 A short walk to the summit of Mt Buller was undertaken. There were glorious views of the surrounding country from the top under rapidly darkening skies. A rapid retreat to the lodge followed as rain began to fall. Some hikers sheltered in a local coffee shop but got drenched walking home. The second day saw Jude leading her first B walk. She led us down a steeply descending trail to the Delatite River valley. We were passed by groups of bike riders at various stages of the walk. 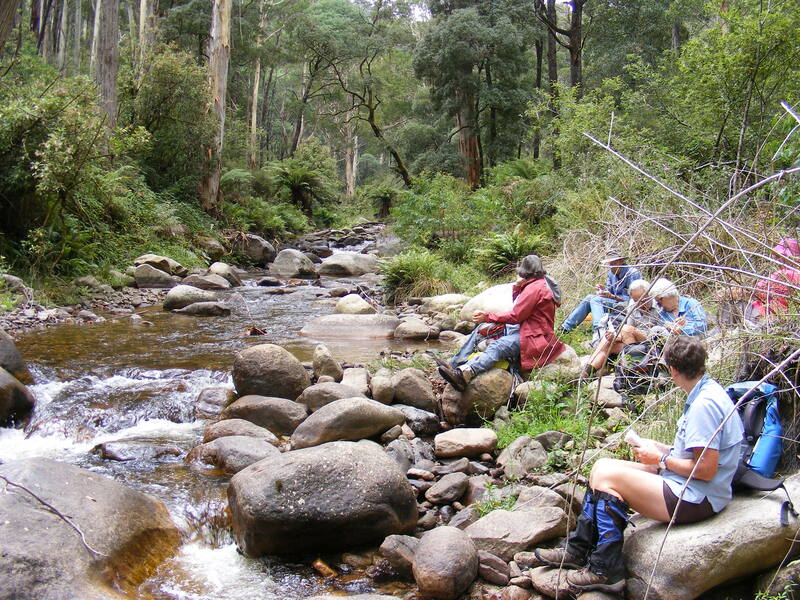 Just before lunchtime we met the C group who had walked up the river from Mirimbah. A highlight of the river portion of the walk was all of the log bridges we had to cross – did anyone count them? A snake sighting at the lunch spot caused some excitement and spilt coffee. Many of us munched on native currants, raspberries and blackberries which grew profusely next to the path. Finally at 1.30pm the cars were sighted and we drove back up the mountain to the lodge. The evening brought an added bonus with a free recital of chamber music in the Alpine Chapel. The Mozart clarinet quintet was superb. Day 3 saw the B group driving down the mountain to Mirimbah then up the other side of the valley to Telephone Box Junction. A hard slog then ensued as we climbed the Summit Loop towards Mt Stirling. Morning tea was called at the Bluff Spur Hut where we sat on carved wooden seats around an open fireplace. Ron cracked the whip and we continued along the West Summit trail past the GGS Hut up to the summit where we had magnificent clear views of the surrounding countryside. We then followed the 4WD track downhill to Howqua Gap where we had lunch. There were many 4WD vehicles on the track and some mountain bikers who tore down into the picnic area as we were having lunch. All good things have to come to an end and this proved true as we had a very hard slog up the Cornhill Track in the afternoon. Most of us were puffed out by the time we got to the top. Unfortunately there was yet another hard climb up to the lodge. Most agreed that it had been “a hard but worthwhile walk”. Monday 25th January was day 4 and the B group split into two. Ten walkers under the leadership of Chris headed off in the direction of Mt Buller with the intention of following the hairy West Ridge trail. Surviving participants described the scramble as “challenging but worth it”. 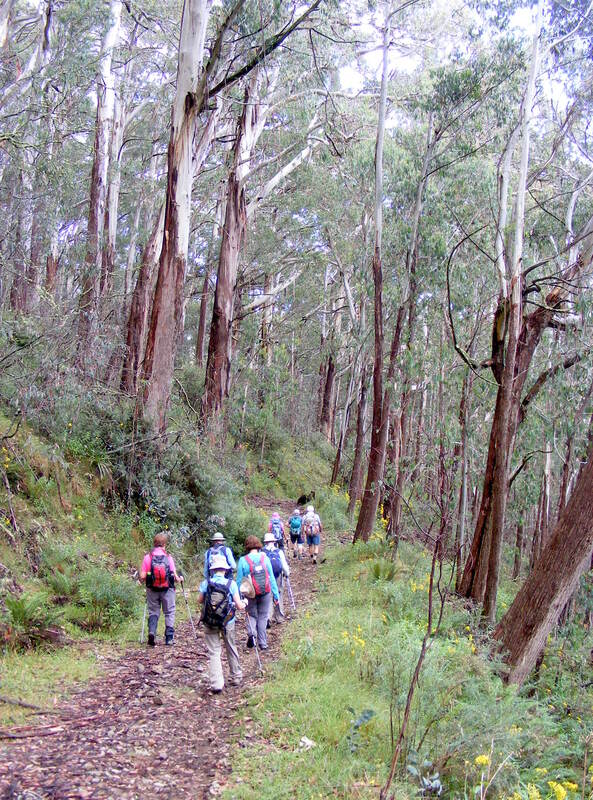 A smaller group of four walkers led by Ron headed down the Klingsporn Bridal track to Mirimbah. This was a pleasant downhill walk along the north east side of Mt Buller. Once we had walked by all of the ski lifts and runs, the trail narrowed which caused some dramas further on as we were passed by mountain bikers hurtling down. A copperhead snake basking in the sun on the path caused a brief interlude just after “Thank Christ corner”. We arrived at Mirimbah safely and had lunch before returning to Mt Buller. Australia Day was a rest day and many of us headed off to Mansfield and Jamieson to shop and sightsee. Some of us were lucky to take part in raising the flag ceremonies. In the evening Libby got us all to sing “Home among the gum trees” as an Australia Day treat – well done Libby! The weather forecast for day six did not look good and we woke to a misty, rainy morning. It was decided to cancel the planned walks due to the inclement weather. After lunch the rain cleared and both groups combined went for a walk down the Cornhill Road. The leaders decided to turn back after an hour and we returned to the lodge. A small group decided to walk back over the Cornhill summit and returned with tales of paths lost and found! A group dinner was held in the Hotel Ahlberg in the evening. The last day on camp opened to misty skies with a little rain. The C group was to hike the Klingsporn trail with me leading a walk for the first time. We walked briskly to the trail head near the Hotel Ahlsberg. Then we had a pleasant walk through the mist which cleared after about an hour. We met a sleepy copperhead snake on the track just before the morning tea stop at Thank Christ corner. Then another snake sunning itself on the track was encountered about thirty minutes later. This one proved difficult to dislodge from the path and moved towards the group at one stage! Eventually it slithered off into the bush and we passed safely. I didn’t want to lose anyone on my first walk as leader! 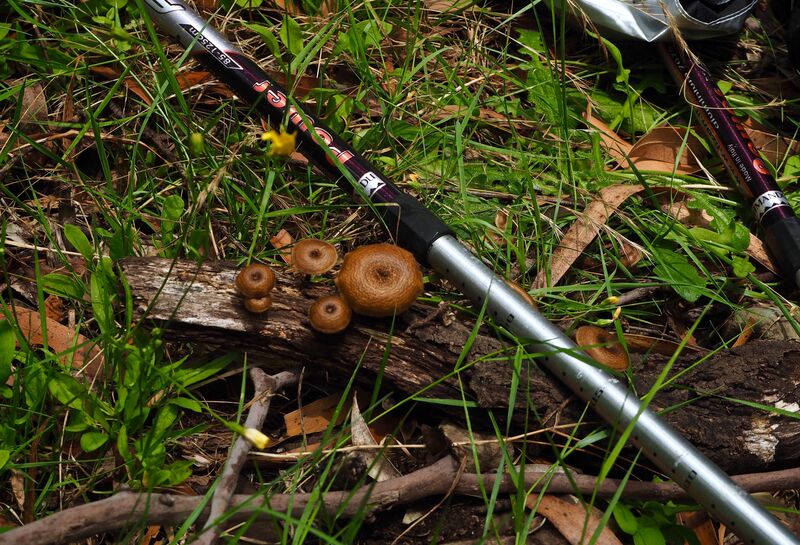 We reached Mirrimbah without further incidents, had some lunch then returned to Mt Buller. This was a great camp with some memorable walks. Special thanks to the organisers Chris, Ron, Pat and Kerry.